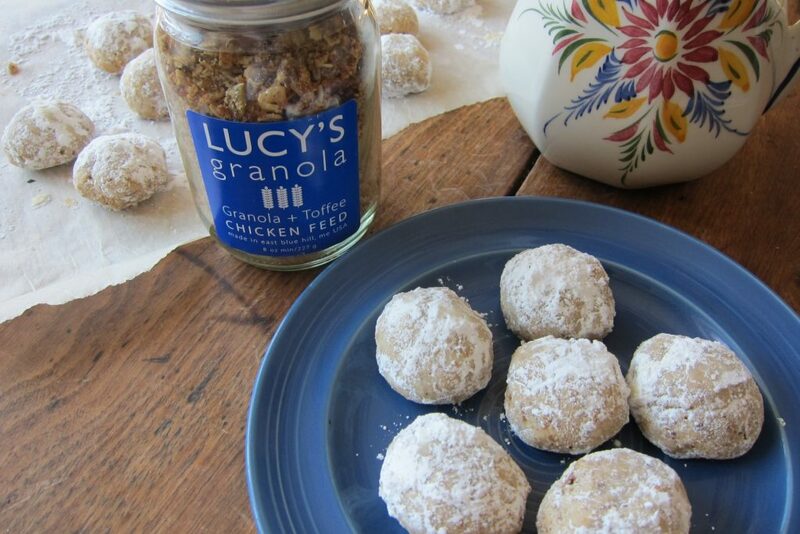 Here is a new twist on a classic holiday cookie. Sometimes called Pecan Balls, sometimes called Mexican Wedding Cakes, or Russian Tea Cakes, or shaped into a curve and called Viennese Crescents. We have tweaked it to make something similar but surprisingly different by replacing some of the nuts with Chicken Feed. The bits of oat, toffee, and chocolate make for a sweet surprise. 2. Beat butter and sugar until light and fluffy. Add vanilla. Add flour mixture and beat at low speed until forms a dough. 3. Working with 1 Tblsp of dough at a time, roll into balls. Bake on parchment lined baking sheets until tops are pale golden, about 17 minutes. 4. Cool on sheet 2 minutes and on rack for 30 minutes. Roll cooled cookies, a few at a time in powdered sugar. You can sprinkle additional sugar on just before serving.